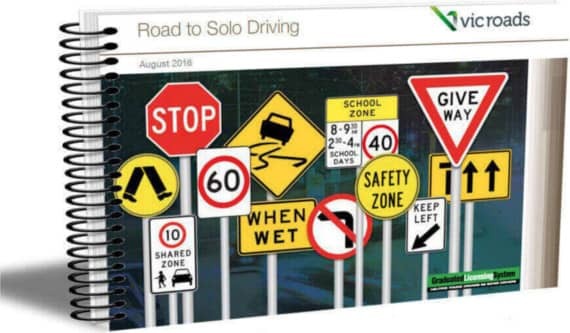 The Road to Solo Driving is the Vicroads learner drivers book outlining rules and obligations to assist new drivers before booking the Learners Permit test. It is also a helpful resource for overseas and international licence holders to gain an understanding of the laws and expectations of driving on roads in Victoria. If you are taking driving lessons your instructor will recommend looking through the handbook from time to time to help improve your road knowledge. As you continue driving you will find much of the information you may have initially scanned over becomes increasingly relevant to common situations you encounter on the road. It is also helpful for supervising drivers to be familiar with its contents when they are preparing to teach a new learner driver. This booklet is available for purchase in hard copy from Vicroads customer service centres and other retail outlets such as newsagents. You can also download a free PDF version directly from the Vicroads website or by clicking the following link. Keep in mind the Road to Solo handbook is a guide only and should be read in conjunction with a solid understanding of our road rules. To gain the most from the booklet your instructor will help you put much of the supplied information into practice as your skills progress. If you are just starting out as a learner driver you may find our observation tips for new learners helpful to get on top of some early car control issues. And to help your supervising driver feel a bit more comfortable in the early stages of your learning check out our tips for supervising learner drivers. Above all else learning good techniques from the start is important to help you make the best progress. Contact us today and let us help you on your journey to driving freedom.